All-dielectric metamaterials have emerged as a promising platform for low-loss and highly efficient terahertz devices. However, existing fabrication methods have difficulty in achieving a good balance between precision and cost. Here, inspired by the nano-template-assisted self-assembly method, we develop a micro-template-assisted self-assembly (MTAS) method to prepare large-scale, high-precision, and flexible ceramic microsphere all-dielectric metamaterials with an area exceeding 900 cm×900 cm. Free from organic solvents, vacuum, and complex equipment, the MTAS method ensures low-cost and environmentally friendly fabrication. The ceramic microsphere resonators can be readily assembled into nearly arbitrary arrangements and complex aggregates, such as dimers, trimers, quadrumers, and chains. Finally, using the heat-shrinkable substrate and dipole coupling effect, a broadband reflector with a bandwidth of 0.15 THz and a reflection of up to 95% is demonstrated. This work provides a versatile and powerful platform for terahertz all-dielectric metamaterials, with potential to be applied in a wide variety of high-efficiency terahertz devices. P. Moitra, Y. Yang, Z. Anderson, I. I. Kravchenko, D. P. Briggs, and J. Valentine, “Realization of an all-dielectric zero-index optical metamaterial,” Nat. 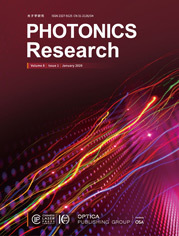 Photonics 7, 791–795 (2013). J. C. Ginn, I. Brener, D. W. Peters, J. R. Wendt, J. O. Stevens, P. F. Hines, L. I. Basilio, L. K. Warne, J. F. Ihlefeld, and P. G. Clem, “Realizing optical magnetism from dielectric metamaterials,” Phys. Rev. Lett. 108, 097402 (2012). A. S. Shorokhov, E. V. Melikgaykazyan, D. A. Smirnova, B. Hopkins, K. E. Chong, D. Y. Choi, M. R. Shcherbakov, A. E. Miroshnichenko, D. N. Neshev, and A. A. Fedyanin, “Multifold enhancement of third-harmonic generation in dielectric nanoparticles driven by magnetic Fano resonances,” Nano Lett. 16, 4857–4861 (2016). P. Albella, R. A. de la Osa, F. Moreno, and S. A. Maier, “Electric and magnetic field enhancement with ultralow heat radiation dielectric nanoantennas: considerations for surface-enhanced spectroscopies,” ACS Photon. 1, 524–529 (2014). M. R. Shcherbakov, D. N. Neshev, B. Hopkins, A. S. Shorokhov, I. Staude, E. V. Melikgaykazyan, M. Decker, A. A. Ezhov, A. E. Miroshnichenko, and I. Brener, “Enhanced third-harmonic generation in silicon nanoparticles driven by magnetic response,” Nano Lett. 14, 6488–6492 (2014). I. Staude, A. E. Miroshnichenko, M. Decker, N. T. Fofang, S. Liu, E. Gonzales, J. Dominguez, T. S. Luk, D. N. Neshev, and I. Brener, “Tailoring directional scattering through magnetic and electric resonances in subwavelength silicon nanodisks,” ACS Nano 7, 7824–7832 (2013). Y. F. Yu, A. Y. Zhu, R. Paniagua-Domínguez, Y. H. Fu, B. Luk’Yanchuk, and A. I. Kuznetsov, “High-transmission dielectric metasurface with 2π phase control at visible wavelengths,” Laser Photon. Rev. 9, 412–418 (2015). M. I. Shalaev, J. Sun, A. Tsukernik, A. Pandey, K. Nikolskiy, and N. M. Litchinitser, “High-efficiency all-dielectric metasurfaces for ultracompact beam manipulation in transmission mode,” Nano Lett. 15, 6261–6266 (2015). F. Aieta, M. A. Kats, P. Genevet, and F. Capasso, “Multiwavelength achromatic metasurfaces by dispersive phase compensation,” Science 347, 1342–1345 (2015). R. C. Devlin, M. Khorasaninejad, W. T. Chen, J. Oh, and F. Capasso, “Broadband high-efficiency dielectric metasurfaces for the visible spectrum,” Proc. Natl. Acad. Sci. USA 113, 10473–10478 (2016). F. Capasso, F. Aieta, M. Khorasaninejad, P. Genevet, and R. Devlin, “Recent advances in planar optics: from plasmonic to dielectric metasurfaces,” Optica 4, 139–152 (2017). K. E. Chong, L. Wang, I. Staude, A. R. James, J. Dominguez, S. Liu, G. S. Subramania, M. Decker, D. N. Neshev, and I. Brener, “Efficient polarization-insensitive complex wavefront control using Huygens’ metasurfaces based on dielectric resonant meta-atoms,” ACS Photon. 3, 514–519 (2016). Y. Yang, I. I. Kravchenko, D. Briggs, and J. Valentine, “Dielectric metasurface analogue of electromagnetically induced transparency,” Nat. Commun. 5, 5753 (2014). E. Semouchkina, R. Duan, G. Semouchkin, and R. Pandey, “Sensing based on Fano-type resonance response of all-dielectric metamaterials,” Sensors 15, 9344–9359 (2015). Z. Huang, J. Wang, Z. Liu, G. Xu, Y. Fan, H. Zhong, B. Cao, C. Wang, and K. Xu, “Strong-field-enhanced spectroscopy in silicon nanoparticle electric and magnetic dipole resonance near a metal surface,” J. Phys. Chem. C 20, 47–50 (2015). P. Moitra, B. A. Slovick, W. Li, I. I. Kravchencko, D. P. Briggs, S. Krishnamurthy, and J. Valentine, “Large-scale all-dielectric metamaterial perfect reflectors,” ACS Photon. 2, 692–698 (2015). P. Moitra, B. A. Slovick, Z. Gang Yu, and S. Krishnamurthy, “Experimental demonstration of a broadband all-dielectric metamaterial perfect reflector,” Appl. Phys. Lett. 104, 171102 (2014). B. Slovick, Z. G. Yu, and M. Berding, and S. Krishnamurthy, “Perfect dielectric-metamaterial reflector,” Phys. Rev. B 88, 5514–5518 (2013). C. Y. Yang, J. H. Yang, Z. Y. Yang, Z. X. Zhou, M. G. Sun, V. E. Babicheva, and K. P. Chen, “Nonradiating silicon nanoantenna metasurfaces as narrow-band absorbers,” ACS Photon. 5, 2596–2601 (2018). H. T. Chen, W. J. Padilla, M. J. Cich, A. K. Azad, R. D. Averitt, and A. J. Taylor, “A metamaterial solid-state terahertz phase modulator,” Nat. Photonics 3, 148–151 (2009). M. Choi, S. H. Lee, Y. Kim, S. B. SKang, J. Shim, M. H. Kwak, K. Y. Kang, Y. H. Lee, N. Park, and B. Min, “A terahertz metamaterial with unnaturally high refractive index,” Nature 470, 369–373 (2011). H. T. Chen, W. J. Padilla, J. M. O. Zide, A. C. Gossard, A. J. Taylor, and R. D. Averitt, “Active terahertz metamaterial devices,” Nature 444, 597–600 (2006). S. Y. Chiam, R. Singh, C. Rockstuhl, F. Lederer, W. Zhang, and A. A. Bettiol, “Analogue of electromagnetically induced transparency in a terahertz metamaterial,” Phys. Rev. B 80, 153103 (2009). R. Singh, I. A. I. Al-Naib, M. Koch, and W. Zhang, “Sharp Fano resonances in THz metamaterials,” Opt. Express 19, 6312–6319 (2011). T. Hu, C. M. Bingham, A. C. Strikwerda, D. Pilon, D. Shrekenhamer, N. I. Landy, K. Fan, X. Zhang, W. J. Padilla, and R. D. Averitt, “Highly-flexible wide angle of incidence terahertz metamaterial absorber,” Phys. Rev. B 78, 1879–1882 (2008). L. H. Gao, Q. Cheng, J. Yang, S. J. Ma, J. Zhao, S. Liu, H. B. Chen, Q. He, W. X. Jiang, and H. F. Ma, “Broadband diffusion of terahertz waves by multi-bit coding metasurfaces,” Light Sci. Appl. 4, e324 (2015). L. Liu, X. Zhang, K. Mitchell, X. Su, N. Xu, C. Ouyang, Y. Shi, J. Han, W. Zhang, and S. Zhang, “Broadband metasurfaces with simultaneous control of phase and amplitude,” Adv. Mater. 26, 5031–5036 (2014). X. Zhang, Z. Tian, W. Yu, J. Gu, S. Zhang, J. Han, and W. Zhang, “Broadband terahertz wave deflection based on C-shape complex metamaterials with phase discontinuities,” Adv. Mater. 25, 4567–4572 (2013). H. Xu, K. Bi, Y. Hao, J. Zhang, J. Xu, J. Dai, K. Xu, and J. Zhou, “Switchable complementary diamond-ring-shaped metasurface for radome application,” IEEE Antennas Wireless Propag. Lett. 17, 2494–2497 (2018). X. Wang, Y. Cui, T. Li, M. Lei, J. Li, and Z. Wei, “Recent advances in the functional 2D photonic and optoelectronic devices,” Adv. Opt. Mater. 7, 1801274 (2018). Q. Wang, X. Li, L. Wu, P. Lu, and Z. Di, “Electronic and interface properties in graphene oxide/hydrogen-passivated Ge heterostructure,” Phys. Status Solidi (RRL) 13, 1800461 (2019). Y. Yang, B. Cui, Z. Geng, and S. Feng, “Terahertz magnetic and electric Mie resonances of an all-dielectric one-dimensional grating,” Appl. Phys. Lett. 106, 111106 (2015). H. Němec, P. Kužel, F. Kadlec, C. Kadlec, R. Yahiaoui, and P. Mounaix, “Tunable terahertz metamaterials with negative permeability,” Phys. Rev. B 79, 241108 (2009). I. V. Shadrivov, K. Fan, W. J. Padilla, and X. Liu, “Experimental realization of a terahertz all-dielectric metasurface absorber,” Opt. Express 25, 191–201 (2017). C. Ouyang, C. Hu, H. Zhang, J. Han, J. Gu, M. Wei, Q. Wang, Q. Xu, W. Zhang, and X. Zhang, “Polarization-independent all-silicon dielectric metasurfaces in the terahertz regime,” Photon. Res. 6, 24–29 (2017). Z. Ma, S. M. Hanham, P. Albella, B. Ng, H. T. Lu, Y. Gong, S. A. Maier, and M. Hong, “Terahertz all-dielectric magnetic mirror metasurfaces,” ACS Photon. 3, 1010–1018 (2016). D. Headland, S. Nirantar, W. Withayachumnankul, P. Gutruf, D. Abbott, M. Bhaskaran, C. Fumeaux, and S. Sriram, “Terahertz magnetic mirror realized with dielectric resonator antennas,” Adv. Mater. 27, 7137–7144 (2015). H. Němec, C. Kadlec, F. Kadlec, P. Kužel, R. Yahiaoui, U. C. Chung, C. Elissalde, M. Maglione, and P. Mounaix, “Resonant magnetic response of TiO2 microspheres at terahertz frequencies,” Appl. Phys. Lett. 100, 061117 (2012). J. A. Fan, K. Bao, L. Sun, J. Bao, V. N. Manoharan, P. Nordlander, and F. Capasso, “Plasmonic mode engineering with templated self-assembled nanoclusters,” Nano Lett. 12, 5318–5324 (2012). J. Gao, C. Lan, Q. Zhao, B. Li, and J. Zhou, “Experimental realization of Mie-resonance terahertz absorber by self-assembly method,” Opt. Express 26, 13001–13011 (2018). M. Walther, A. Ortner, H. Meier, U. Loffelmann, P. J. Smith, and J. G. Korvink, “Terahertz metamaterials fabricated by inkjet printing,” Appl. Phys. Lett. 95, 251107 (2009). K. Takano, T. Kawabata, C. F. Hsieh, K. Akiyama, F. Miyamaru, Y. Abe, Y. Tokuda, R. P. Pan, C. L. Pan, and M. Hangyo, “Fabrication of terahertz planar metamaterials using a super-fine ink-jet printer,” Appl. Phys. Express 3, 016701 (2010). M. S. Wheeler, J. S. Aitchison, and M. Mojahedi, “Coupled magnetic dipole resonances in sub-wavelength dielectric particle clusters,” J. Opt. Soc. Am. B 27, 1083–1091 (2010). M. Caldarola, P. Albella, E. Cortés, M. Rahmani, T. Roschuk, G. Grinblat, R. F. Oulton, A. V. Bragas, and S. A. Maier, “Non-plasmonic nanoantennas for surface enhanced spectroscopies with ultra-low heat conversion,” Nat. Commun. 6, 7915 (2015). J. H. Yan, P. Liu, Z. Y. Lin, H. Wang, H. J. Chen, C. X. Wang, and G. W. Yang, “Magnetically induced forward scattering at visible wavelengths in silicon nanosphere oligomers,” Nat. Commun. 6, 7042 (2015). B. Hopkins, D. S. Filonov, A. E. Miroshnichenko, F. Monticone, A. Alu, and Y. S. Kivshar, “Interplay of magnetic responses in all-dielectric oligomers to realize magnetic Fano resonances,” ACS Photon. 2, 724–729 (2015). J. Sun, L. Kang, R. Wang, L. Liu, L. Sun, and J. Zhou, “Low loss negative refraction metamaterial using a close arrangement of split-ring resonator arrays,” New J. Phys. 12, 083020 (2010). G. Zhang, Q. Liao, Z. Zhang, Q. Liang, Y. Zhao, X. Zheng, and Y. Zhang, “Novel piezoelectric paper-based flexible nanogenerators composed of BaTiO3 nanoparticles and bacterial cellulose,” Adv. Sci. 3, 1500257 (2016). K. Bi, M. Bi, Y. Hao, W. Luo, W. Cai, X. Wang, and Y. Huang, “Ultrafine core-shell BaTiO3@SiO2 structures for nanocomposite capacitors with high energy density,” Nano Energy 51, 513–523 (2018). de la Osa, R. A. Fig. 1. Illustrations of the (a) NTSA  and (b) MTAS methods. Fig. 2. Microscope images of the fabricated (a) ZrO2 and (b) Al2O3 all-dielectric metamaterials. Photographs of (c) the fabrication process and (d) the fabricated ultra-large-scale flexible all-dielectric metamaterial using the MTAS method. (e) Simulated and measured transmissions for ZrO2 and Al2O3 all-dielectric metamaterials. The insets are simulated magnetic field intensity distributions at the corresponding resonance dips in the H–k plane. Fig. 3. Illustrations of preparation for a touching (a) dimer, (b) trimer, (c) quadrumer, and (d) chain. The upper insets are templates and those below are the resultant metamaterials. (e)–(h) Corresponding fabricated samples. Fig. 4. Simulated transmissions of dimer all-dielectric metamaterial with different spacings. The insets are the simulated electric field intensities. Fig. 5. Schematic illustrations of (a) a metallic reflector and (b) an all-dielectric metamaterial reflector. (c) Simulated reflection of the all-dielectric metamaterial with different lattice constants. Calculated effective permittivity and permeability with different lattice constants: (d) P=160 μm, (e) P=120 μm, and (f) P=90 μm. The regions where the effective permittivity and permeability have opposite signs are marked in blue. Fig. 6. (a) Fabrication process of the broadband terahertz all-dielectric metamaterial reflector based on shrinkable film. Microscope images of the all-dielectric metamaterial (b) before and (c) after HT. (d) Measured reflections of the fabricated terahertz all-dielectric metamaterial before and after HT.